This is the follow up of the cult classic Tête de la Course. Basically the same game with the rules slightly rewritten (to make them more clear), and more sensible presentation. 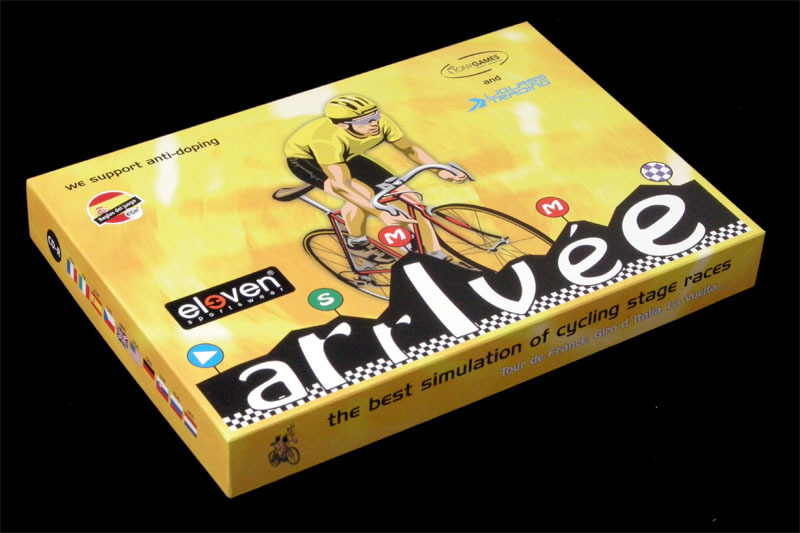 Where you had to buy a lot of big boards to be able to run all the different stages, now you find everything that you need in a regular games' box, including a three booklets with all the stages for a Tour de France, a Giro d'Italia and a Vuelta a España. What is better, you have can buy the game in many different languages. Actually, it is only the rules booklet that is different, since all the elements in the game are cleverly designed to be language-independent. The game includes a CD with rules in all the available languages: Czech, English, German, French, Dutch, Spanish (translated by yours truly), Italian, Slovak and Russian. The CD also has tables to keep the classifications and a "weather pack", an extension already featured in Tête de la Course. Of course, the obvious question arises: Is this a different game from Tête de la Course? As far as I am concerned, it is. It has a different name, a different presentation, a different board system, a different distribution... (Just like I think that Maillot Jaune, Les Géants De La Route and Winning are different games). The second question is: is it better than the previous game? Here the question is difficult to answer. While I love some of the elements of the first game, specially the big boards, its stenght was its weakness: you simply could not have all the boards to play all the posible stages. Arrivée solves this problem by having a modular board. The fact that I find the old big bords unbeatable does not mean that I do not like the new one. It is very well produced. Quite cute, actually. 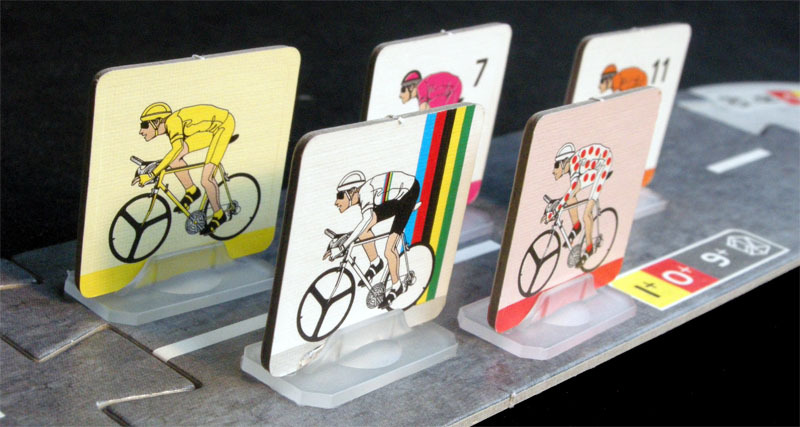 (Maybe I also prefer the first-edition cyclists, but these were already unavailable, and the difference is quite small. These are not bad either). As for the rules, you can check what I wrote about Tête de la Course, since the basic rules are very much the same and there are only minor changes in the advanced rules. 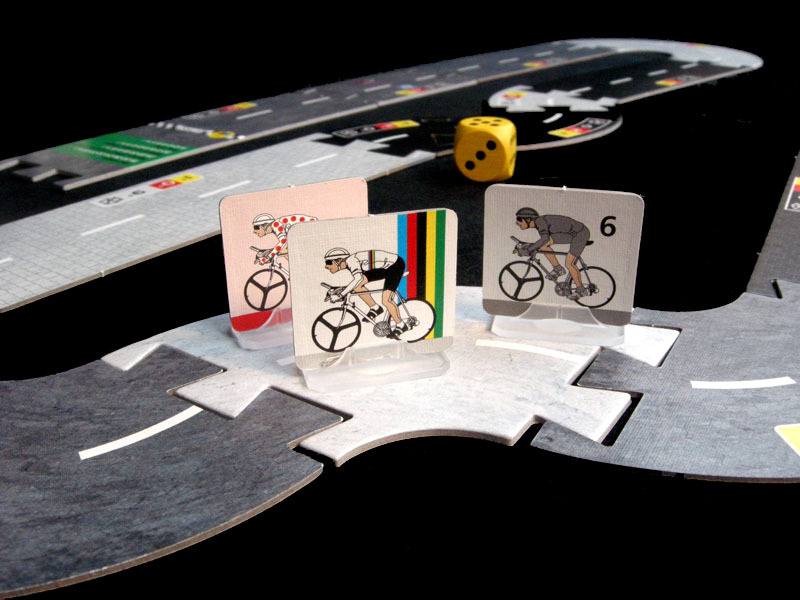 It is a family dice game with a quite ambitious set of advanced rules which cover all kind of situations that one can find in a cycling race. It is one of those games that I wish I had had when I was 12 years old. I would have spent many hours with it. I was wondering if the rules ara available on the official website.I haven't found them. However, there is a gift. A free template to build a Liege-Bastogne-Liege. Click here to download it. (Update: other race templates are also available in the official website as free downloads, and there many more in the unofficial site). Check the game's official website http://www.arrivee.cz/ for more pictures and information about where you can find the game.